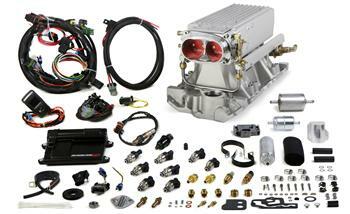 Holley EFI System - Avenger Stealth Ram System UNIVERSAL - MiataRoadster - Stay tuned with MiataRoadster! You’re sure to get some attention when you pop the hood and show an Avenger Stealth Ram™ Multi-Port EFI system! Available for traditional or Vortec headed SB Chevys, the Avenger’s self-tuning capabilities make it as easy as 1, 2, 3 to get your car up and running with EFI. The tunnel ram design of the Stealth Ram™ builds power in the upper RPM range while maintaining excellent mid-range torque as well. Avenger Stealth Ram™ systems include: intake manifold, billet throttle body, ECU, wiring harness, fuel rails, injectors, fuel pump and related small parts. Set up is done on the included hand-held tuner so no laptop is required!